Constipation due to heat, dryness and stagnation. 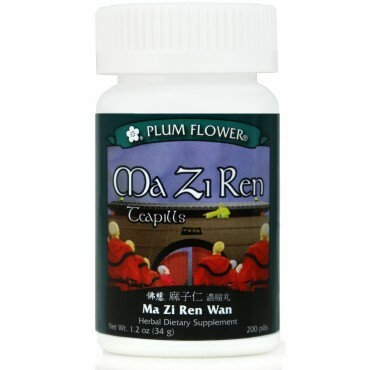 Heat and excess imbalances with yin depletion with symptoms of dry hard stool, frequent urination and dry mouth. Constipation following illness, childbirth or surgery. Hemorrhoid accompanying constipation and abdominal pain due to worms are some of the imbalances satisfied clients have used this product for. Linum usitatissimum seed, Prunus armeniaca seed, Citrus aurantium fruit- immature, Magnolia officinalis bark, Paeonia lactiflora root, Rheum palmatum root & rhizome, Activated carbon, Botanical wax, Talcum. - Ya ma zi, Xing ren, Zhi shi, Hou po, Bai shao, Da huang, Activated carbon, Botanical wax, Talcum. Contraindicated during pregnancy and menstruation. Contraindicated for very weak or deficient individuals. Use with caution in breast-feeding women as Dahuang/rhubarb can pass through the breast milk causing colic and diarrhea in infants. Use with caution in Spleen deficient individuals with a tendency to loose stools, diarrhea, poor appetite or chronic digestive weakness. May cause mild abdominal cramping and/or diarrhea in sensitive individuals. Contains tree nuts.